I discovered this tiger swallowtail butterfly struggling in the tall grass. He was pretty tattered. I boosted him up to an ironweed bloom for a meal. He immediately began drinking nectar from the flowers, pictured below. Hopefully my random act of kindness will buy him a little more time to a very brief life. Ironweed is a challenging flower to photograph because the purple just will not come out in camera. It wants to fade from a rich purple to a bluish color of some sort. I find that underexposing the photograph then bringing it back up in post-processing tends to do a better job of keeping the color, but it is still not perfect. UPDATE September 6: My friend the swallowtail made it through the night. I found him clinging to the blooms on the same ironweed this morning. He had not left; I presume he can’t fly, and he knows it. He was enjoying the sun, at least, and still had plenty of blossoms handy for nectar. I grabbed another photograph of his bedraggled backlit by the morning sunshine, at the end of this post. 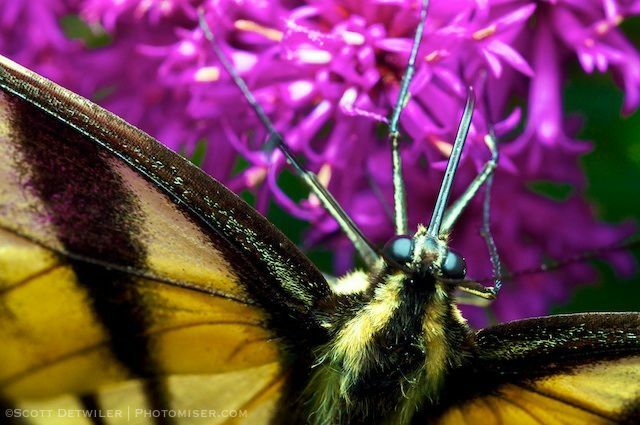 This entry was posted in Macro Photography, Photomiser Gallery and tagged Butterfly, Insect, Nikon SB-600 SpeedLight, wildflowers. 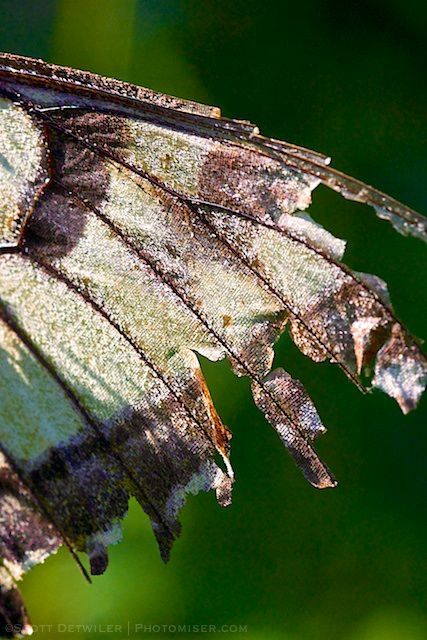 Even though he’s a bit bedraggled, he is still a beautiful butterfly. Thanks for the hint about photographing purple flowers – I will bear it in mind next time I’m photographing similar flowers. Thanks for commenting. The other thing I tried that had promise was to photograph in shade or in twilight.